why should I have access to the recesses of someone's heart. What Ghalib is essentially saying, in my interpretation is that "unless my pen has the will and the strength to honestly convey the interests and thoughts of those who cannot speak, why should I continue to enjoy their trust and have access their hearts. This takes an important perspective in today's context, where a day ban on NDTV has given an opportunity to Ravish Kumar for making his point, however, fallacious it may be, in an entertaining way. This, in itself, is not a very bad thing, except for the fact that it was projected as a part of News program and by implication was supposed to be represent fact. It is nothing of a news but a drama, devoid of facts, full of implied innuendo and fake claim of victim-hood. 1. NDTV ran live reports, right in the middle of terrorist attack in Pathankot, where the reporter broadcast live the location of ammunition depot, the location of Aircraft in the airbase, vis-a'-vis the location of the terrorists. 2. The ban has been imposed under Rule 6(1) (p) of the Cables act. The act prevents live telecast during anti-terror operations. 3. While we are being made to believe that this was the some kind of first ever action on any TV channels, there have been multiple instances where channels have been banned from operation from duration varying from couple of days to a month for telecasting content not compliant to the act. This is probably the first for this government which Leftist intellectuals fondly call Fascist, headed by the man, again they fondly call the murderer of Gujarat, in public forums. That the man has been elected by unwashed masses is of no discomfort to them. 4. False equivalence being drawn with newspaper reports containing the same details, happily ignoring the fact that newspapers do not and cannot report live and therefore carries the danger. 5. The media, by the virtue of being called public media is co-owned by the consumer and the creator, is used in this instance, as it was in the instance of Radia-gate, to put forth the view of the channel, the anchor and the management, without any voice of the consumer. This necessitates mime as a prop, instead of panelists with even the pretense of multiple opinions could be held. 6. Your have not been banned for questioning the Modi government. While that takes the sheen off your fake revolutionary image, that is the fact. You continue to troll Modi even in this program, with impunity. When facts are fickle and the truth is tame, rhetoric is the last refuge. This is what media is doing. 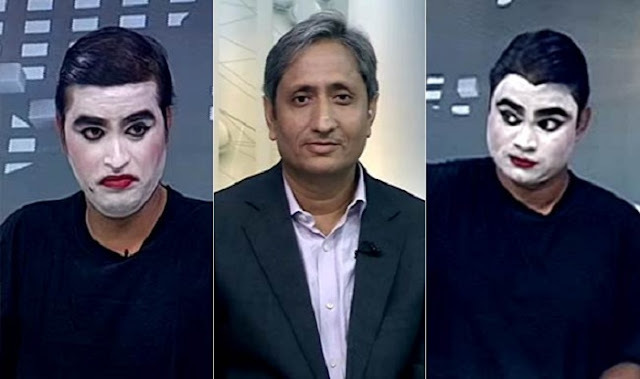 This is what Ravish Kumar did the other night. The current lot of celebrity journalists are like soap-opera artists and are as self-conscious. They are the product of grandiose self image and false sense of self-entitlement, which they now find quickly slipping through their fingers. Ravish Kumar in the show placed two mimes, one named authority, another troll. His attempt was to show how the two are acting in connivance to disturb the natural order of things. His interpretation of the natural order of the things is quite Brahminical, a term often used in derogatory sense by the leftist media. There is an entitled class of journalists, far away from the class of journalists like Jagendra Singh (burnt alive under the watch of 'secular and socialist' government of UP) or Rajdeo Ranjan (Journalist shot dead in broad daylight under the secular watch of Bihar government). The elite TV journalists have made their career in the new wave of opportunity created by the launch of a slew of private news channels in mid to late 90s. The channels were not looking for great journalistic ethos, great writing techniques, greatest of integrity. Those were already taken by the print media. The TV media, which was a new animal, needed pretty good-looking faces, camera-friendly as they call it, and the pretty language, the class, the elan. It was like the Y2K hirings in IT industry, mass and mediocre, but eventually leading to great material success. Those who looked down at it calling it dishonest and clerical stayed put on the conventional mode of profession and continue dying in the hinterlands of Bihar and UP. The baba logs of journalism were quickly adopted by the dishonest government to extend the propaganda and kill the discontent. They built huge houses in south Delhi, had dinners with the powerful, aligned people for cabinet posts, and claimed to represent the poor in the far, remote corners of the country, to which they seldom traveled hiding behind what they called tyranny of distance (which never prevented from covering US elections from New York or lectures in some universities in Washington). When questioned, they hid behind the fictitious image of the journalist which common men held so dearly in his mind through the ages- the journalist, smoking cheap cigarettes through dark nights, angry with the world, furiously writing, all the time threatened by the corrupt police, politicians and bureaucrats, those thick, cheap plastic framed spectacles, and those loose check-patterned cotton shirts on impoverished frames, chasing the lofty ideals of truth and justice for the weak and the poor, dying all the while in his poor existence. That image guarded this new generation of TV Journalists from Public scrutiny, while their own conversations happened over Champagne, and their luxury vehicles ran over crushing the voice of their own unsuspecting viewers. The freedom of expression offered by the government of the day, for them was measured by the freebies they were granted, apart from the say in power structure, like well, government appointments and policy making. Those they call troll in the studious, and block with the vengeance on the social media are the very readers/ viewers they reach out to. They never realized this, they never cared for it. They never thought law would catch up to them. PRESS written to the back of their fuel guzzling SUVs, was their passport to a world of elitism where the protests from the people never reached. The change of government made them very angry. They voiced their own opinion contrary to the opinion of the masses which spoke and brought in a new government with a strong and clear majority. Their purpose of carrying the pen, and the microphone was to amplify the opinion of the masses. They expropriated the resources, took proprietorship of the media which was given to them only for becoming the voice of the masses and made it their own, if not their master's voice. If Shekhar Gupta spoke of fake coup in terms of Indian Army, this was a real coup of intellectual army. Instead of weapons, here was media instruments and media space which was given to them to protect the people, which they turned against the people. People were called trolls. It was equivalent to the armed forces calling citizens stupid and train guns on them. Journalists were our thought soldiers. I remember on Interview of Smriti Irani by Barkha Dutt, where when She asks the minister about her view on the media. When Smriti Irani starts speaking, Barkha cuts her in between, trying to defend herself, explaining why what she presented in her reports was justified. Of all the things wrong with the interview, the most important was that the anchor felt she was more important that the person being interviewed. Ideally, even if Smriti were to ask Barkha as to why she did what she did, Barkha should have responded that her own ideas, interests and views were of no consequence. Rather here we had Barkha cutting the person she was interviewing to put forth her own view. Such was the sense of stardom and intellectual elitism, if we do not even go to people threatened by media stars and even coarsely abused, forget blocked on social medium. "Shooting the messenger" is a quote oft used by the media to defend itself. Unfortunately, what we see now, on channels like NDTV (and I am not even going into their NGO avatar where they filed appeal to NGT seeking to stop all development work, and sacking of all the officers involved in that work on Indian ports), and journalists who are not known for academic brilliance on the Governing councils of educational institutions, becoming the message or the story themselves. Pray tell me whose message they carry, if not their own. They are no longer the messenger. They have become the message and the object of the story. They are not writing the headlines; They are the headlines now a days. The class divide among journalists is also blatant and vivid. The journalist is the lobbyist. The collective stomachs of elite, English-speaking lobbyist of a journalist, churns not at the killings of vernacular, old definition of the journalists; but only with the pushing away of the Gucci-trotting elites, whose i-Phones get scratches in the melee. It is only the latter which will bring them out on the streets. A competing anchor being sacked bring in collective glee from their faces, and then they talk about coming together to be some sort of Avengers for the media, when one of their own is penalized for breaking the laws. Everyone talks about self-regulation, but self-regulation would depend on having a conscience. It would mean having basic decency of calling the things as they are. When you run a one hour program trolling the government and your viewers alike, you cannot claim emergency. With this backdrop it is doubtful how effective your self-governance will be. As Ghalib said, If your pen is not longer having the heart, or ears for the common folks (who you block on Social media, which is only platform they can reach you and who you make fun of using the same resources created ostensibly to defend them) why should you have the support of them? Your utopia has been rudely intruded upon by the common-folks. Your intellectual priesthood has been blasphemed against. You have bitten the hand that fed you for far too long. And I am not talking about the government, I am talking about the hand of the last man in the last line of development who entrusted you with that pen, that microphone, which you pimped for that Kothi in South Delhi, obtained in return of arranging a kothi for someone in the Lutyens. You have blocked, maimed and mocked the person whose opinion you were supposed to carry to the government, who was supposed to consume the content your created. Your mediocre talents and your bigoted falsehoods are exposed by those who never had public space of discussion available to them. You must rise to the occasion, and creep out of this manufactured victim-hood, because no one is buying it anymore. The castle has fallen to the violent winds of democratization of truth. Do not get offended by the people who are more talented and more dogged in their researches, because they are driven not by monetary needs. They are engineers, doctors and CAs by the day, and their day jobs run their kitchens. They are driven by public interest, the search of the truth, just as the journalists in conventional sense once used to before the babalog trooped in. The castle has fallen, the cookie has crumbled. Dramas won't help, a little sincerity might. A pretty, camera-friendly face will not suffice. That is your only hope, Ravish Kumar. For common people as myself, I suggest, if you are watching that ridiculous drama of Ravish Kumar to pause it awhile and read following quote from Ray Bradbury, the greatest sage against censorship on TV journalism, in his book Farenheit 451. "The television is 'Real'. It is immediate, it has dimension. It tells you what to think and blasts it in. It must be right. It seems so right. It rushes you on so quickly to its own conclusions your mind hasn't time to protest,'what nonsense.'"